Want to escape, to go out of the beaten tracks and discover the mountains otherwise. Explore the immense area of the Portes du Soleil with a local professional who will chose infrequent tracks adapted to your level. Beginner or experienced ski touring level, at your own pace, discover the most beautiful areas, itineraries and peaks of the Portes du Soleil. * 15 € for each extra person. 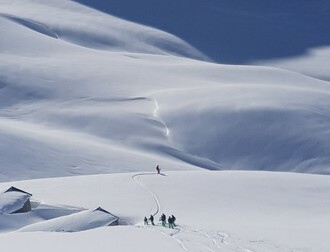 Half day morning or afternoon for a skier who would like to discover ski touring, but has got a good level of downhill skiing. The price includes the supervision by a certified professional, the loan of the safety equipment (arva/spade/sonde ) and the ski equipment (ski touring boots /skis/seal skins). Group of 3 to 6 people. DVA (Avalanche Victim Detector) and a safety backpack containing shovel and detection probe is compulsoty (can be borrowed from the ESF). Portes du Soleil skipass is strongly advised.